We leave Yeti “Resort” around 1:15 for the base camp. 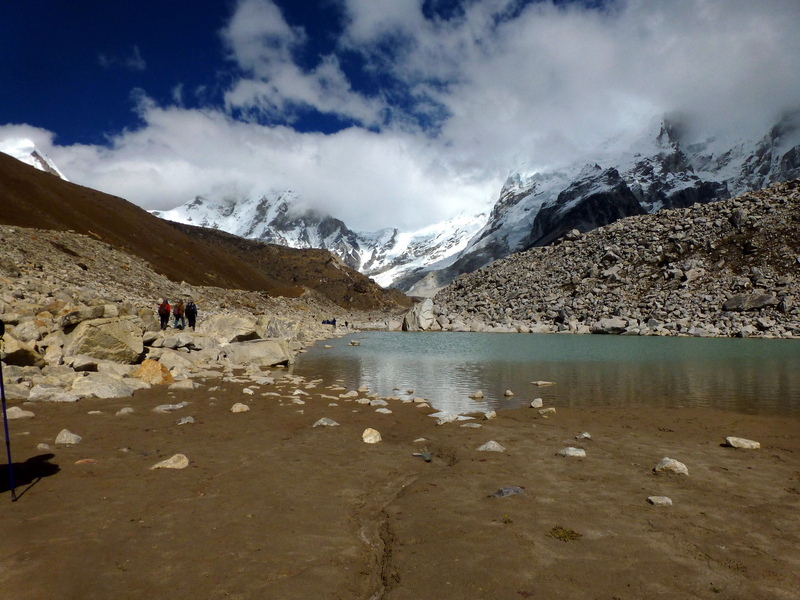 The trail from our hotel goes through a flat sandy frozen lakebed up to a ridge separating the Khumbu Glacier from the lakebed. 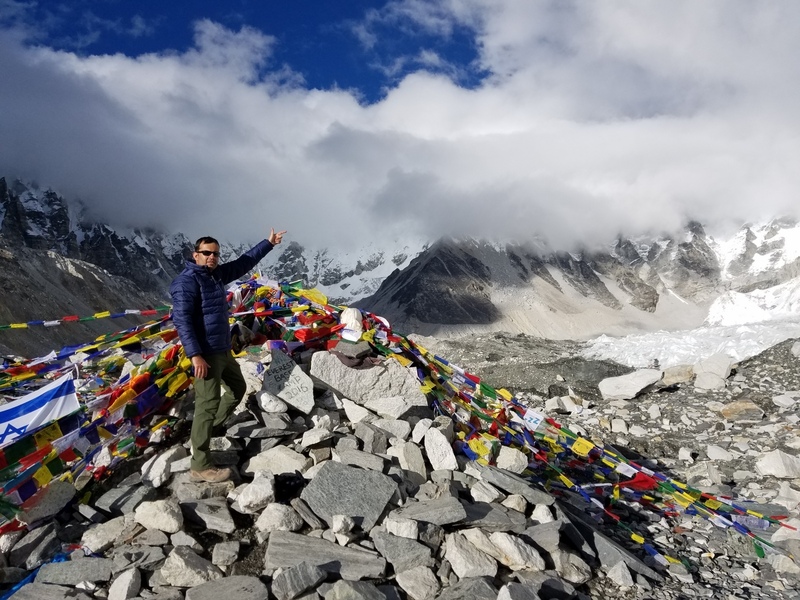 As you walk towards the base camp, Pumari is on your left and the Everest range is on your right with Khumbu glacier in between. 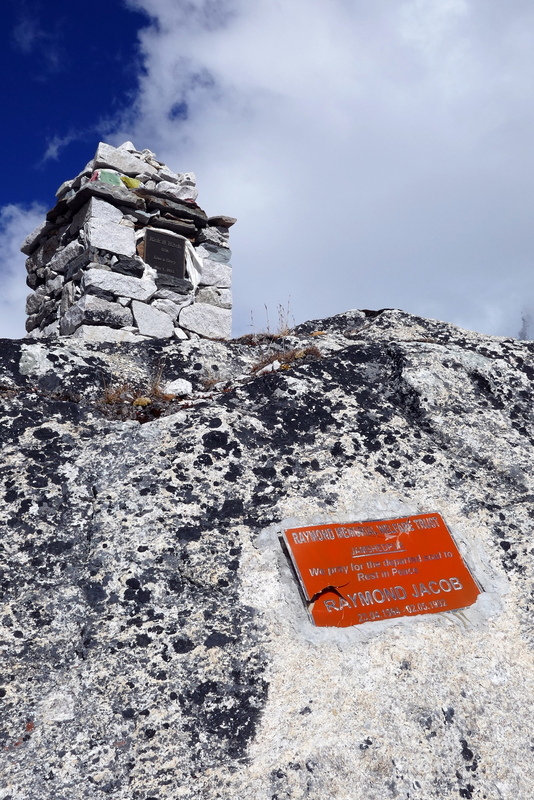 About 15 minutes into the trek, we see some monuments dedicated to the those who lost their lives attempting to climb the highest mountain in the world. 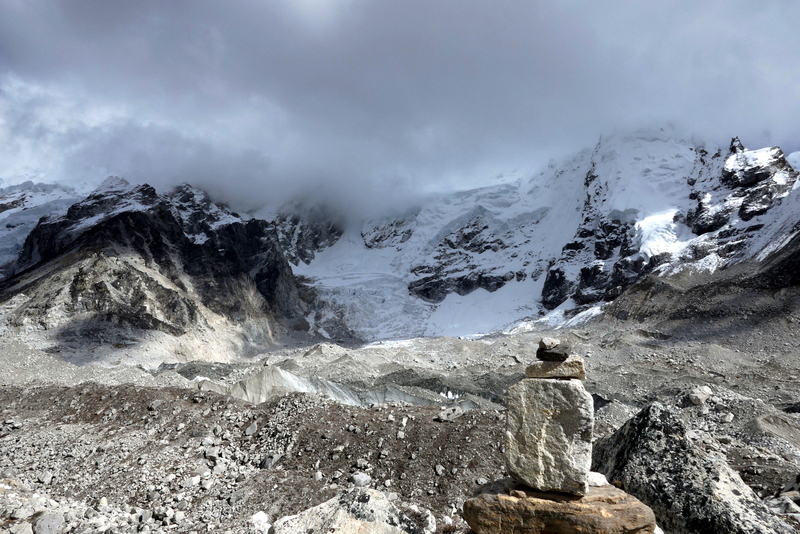 Along the trail, I see two sherpas partially lifting a young women rushing towards Gorakshep. It seemed like they were almost dragging her as if she was not able to walk. 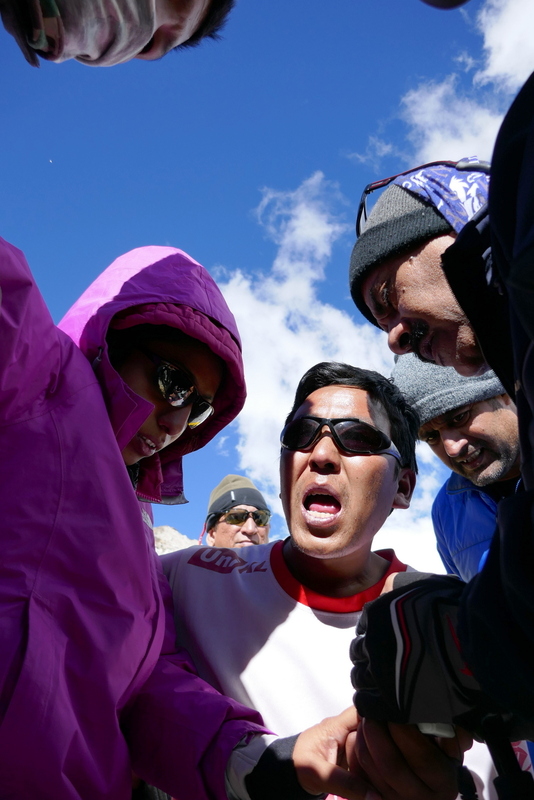 We stopped and talked to them – it turn outs she was having a severe episode of AMS and was panicking so the sherpa guides were taking her back to Gorakshep – and perhaps even lower altitude. Doctor Dipak from our team checked her vitals and provided some medical advice. Later on, after returning to the lodge I discovered that the young women was a medical doctor herself and was OK after reaching Gorakshep and taking some rest. 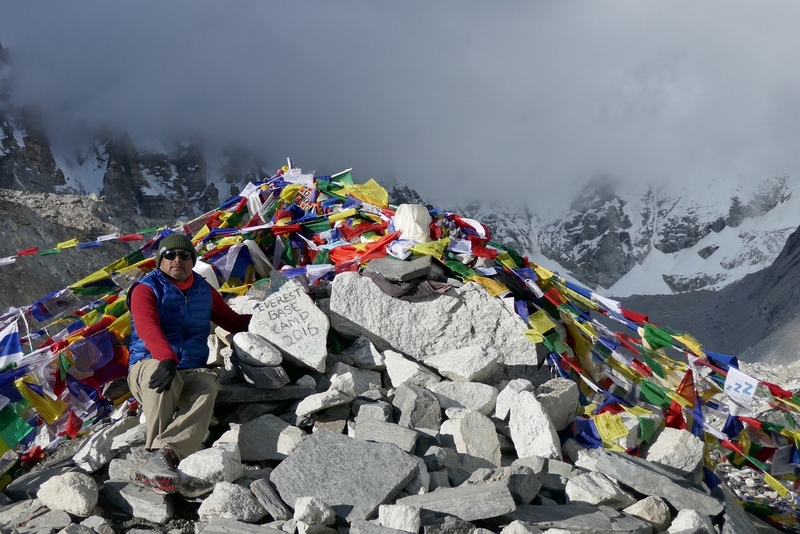 The elevation gain between Gorakshep to the base camp is about 220 meters so there are no steep mountains to climb like we did before reaching Namche Bazaar. 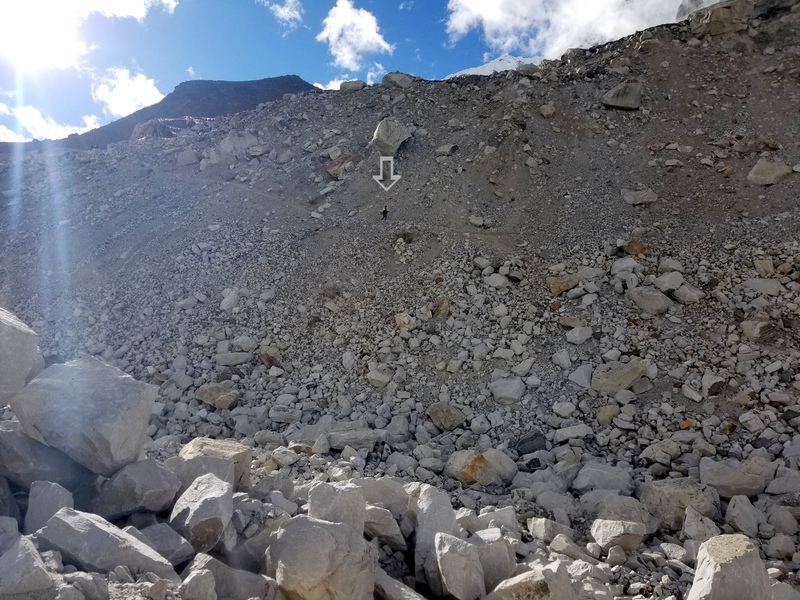 The trail to EBC is not really difficult but meandering the glacier moraine with large rocks makes it a bit challenging. The trail is more or less flat with a gradual incline in parts. Here is a picture collage of the glacier and ice fall views from the trail. A small video clip from the trail just before reaching the base camp. 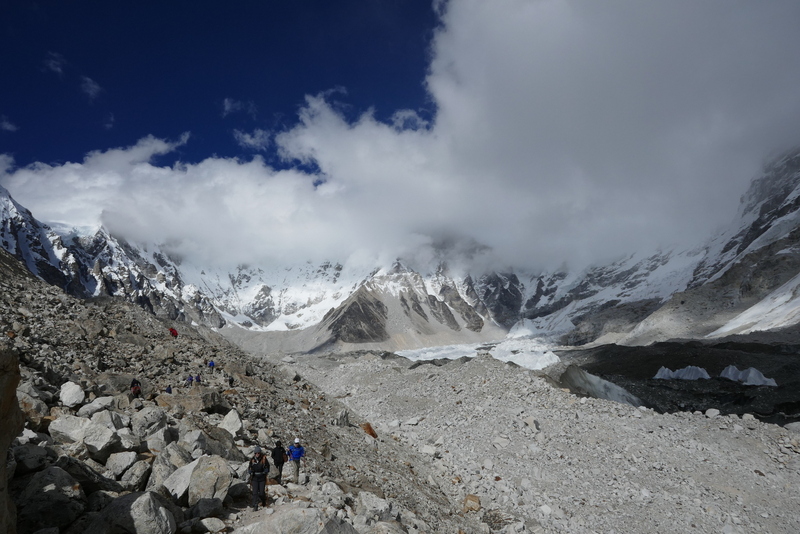 Right before the base camp, you descent to cross the glacier moraine and climb up to the base camp. Steep descent before crossing the glacier to reach the base camp. Arrow shows a hiker for scale. 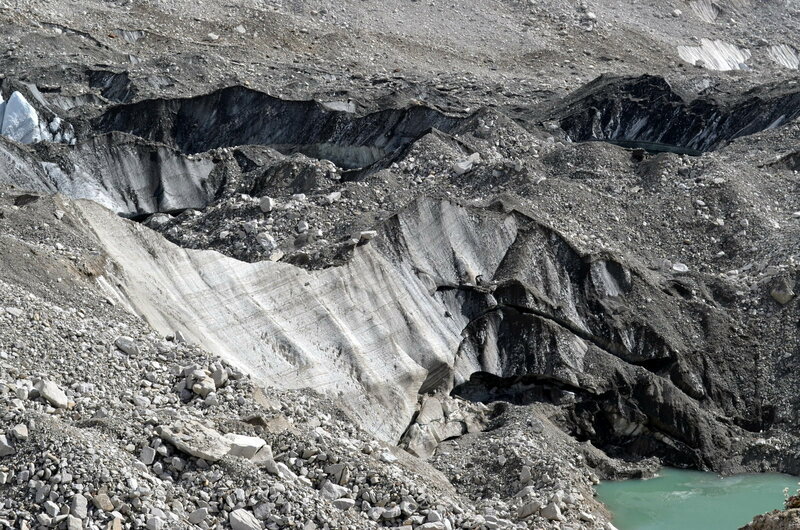 Crossing the glacier to reach base camp (hidden behind a ridge in the middle of the picture. 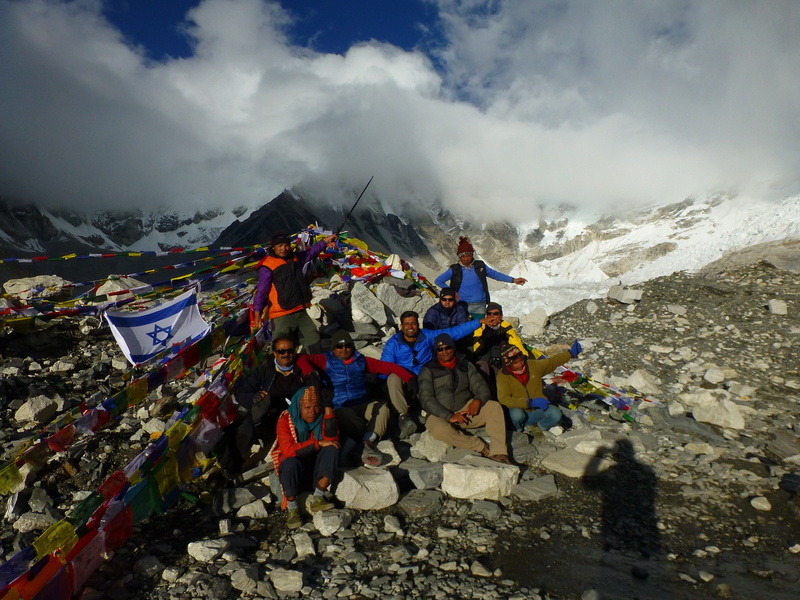 The distance between the base camp and Gorakshep is not that much either, about 3.5 km. The problem is altitude, low oxygen, very low temperature, and rocky terrain of this trail. Every step here required 100 times (that’s how I felt!) more efforts than my practice hikes. 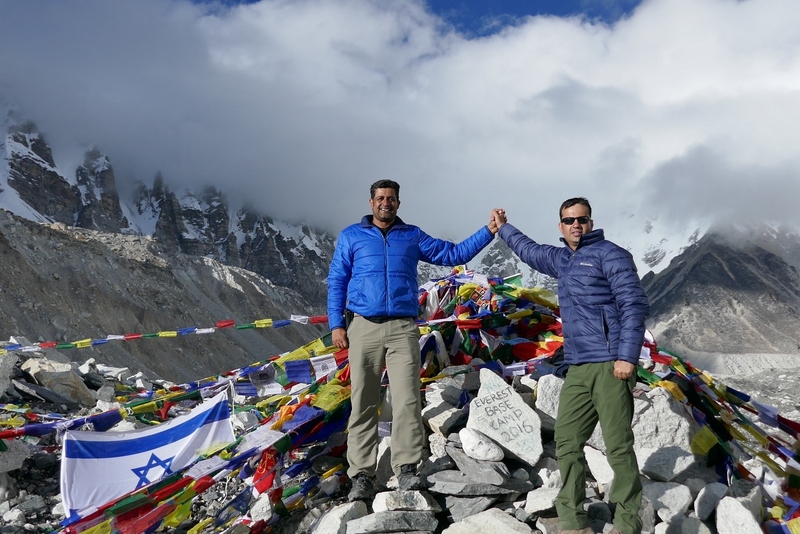 To make things worst, this is on day 9 – the tail end of the EBC trek after grueling routine of 6 to 8 hours daily hiking, sleepless nights, and altitude (or Diamox) induced starvation. 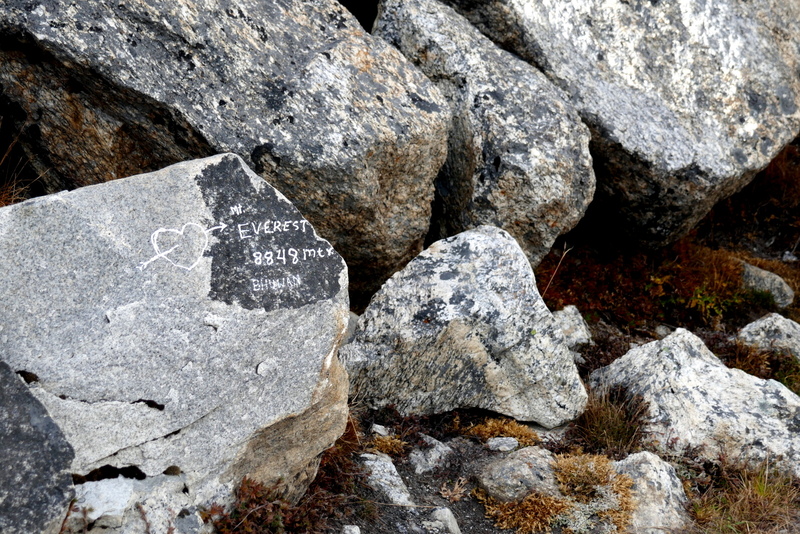 Along the trail I saw several rocks where hikers left their names and messages. I think people should leave these rocks alone. As you probably know, you cannot see Mt. Everest from the actual base camp.Mount Everest is visible up to mid-point of this trail if there are no clouds. During our trek, there were thick clouds constantly looming over Mt. Everest and Nuptse we had very brief window of opportunity to see the illusive Everest. 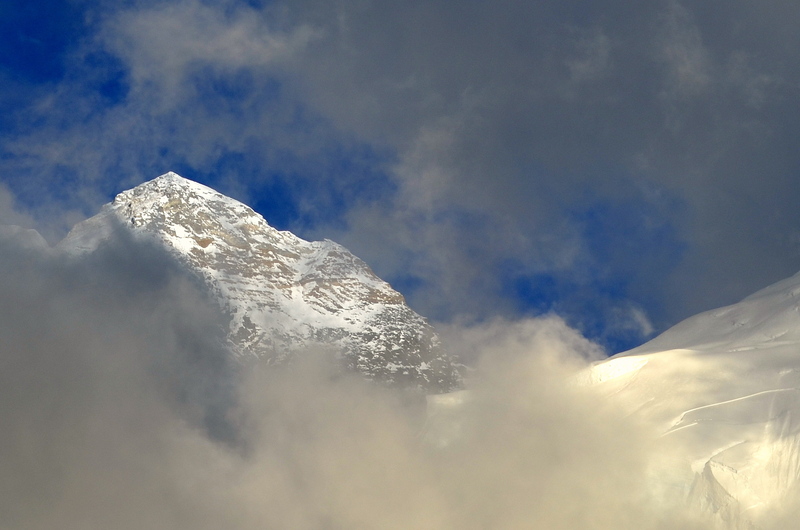 Here are some quick snaps of the majestic mountain during those momentary openings in the cloud. Moon was a bonus. 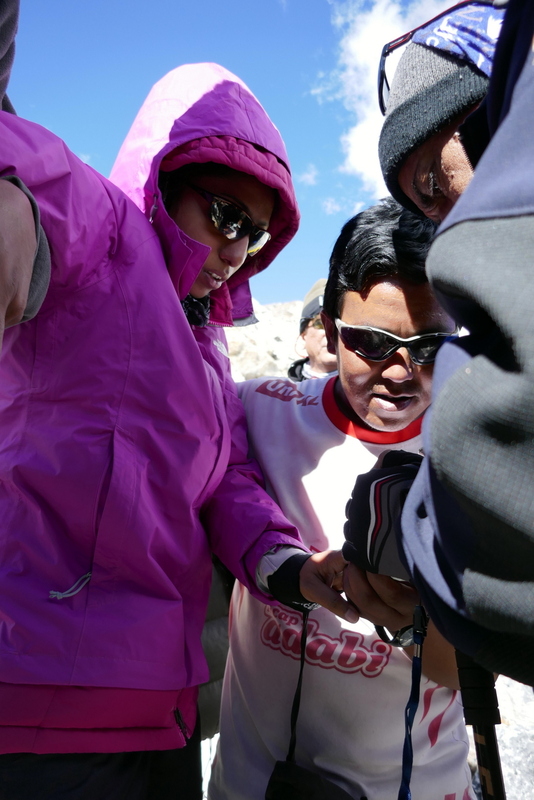 As we get closer to the base camp, we see the Khumbu Ice fall to our right which is the first obstacle climbers face when they leave the base camp and climb towards Camp 1. 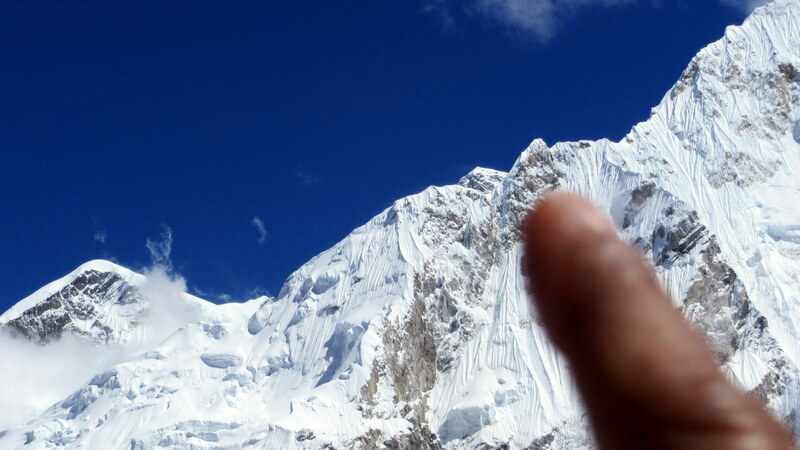 My guide Tshering pointed out a general route climber follow to cross the dangerous Khumbu Icefall. Rock solid ice sheet covered with dirt and rocks give an illusion of a large boulder from a distance. Some of these are exposed from side and you can see dense compact ice underneath. A large boulder over glacial ice ready to slide at any time! 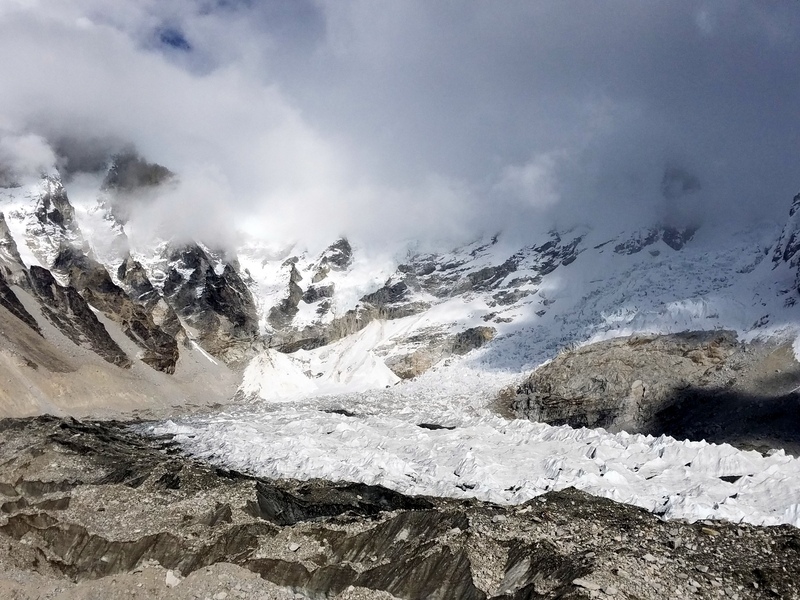 Tshering tells me that the base camp is not a fixed location, it keeps moving over the years (perhaps due to receding glacier or tectonic movement). Clouds at lower level covering majority of the view – you can barely see the tip of Mt. 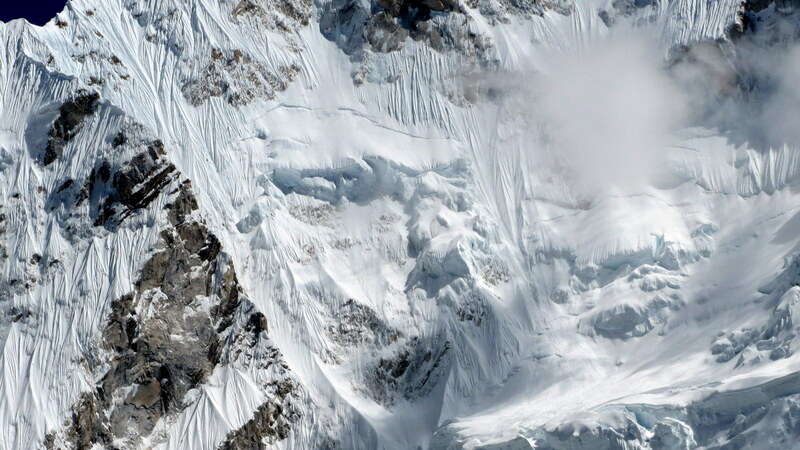 Everest in the upper middle portion. 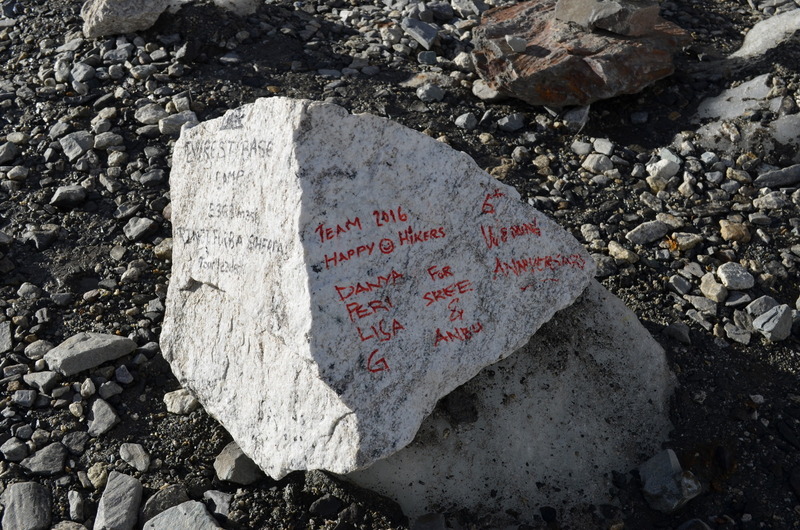 The Everest Base Camp is marked by a pile of rocks topped with a large rock tablet with Everest Base Camp 2016 engraved on it. There were numerous prayer flats, country flats, personal mementos, and other “offerings’ previous hikers left there. 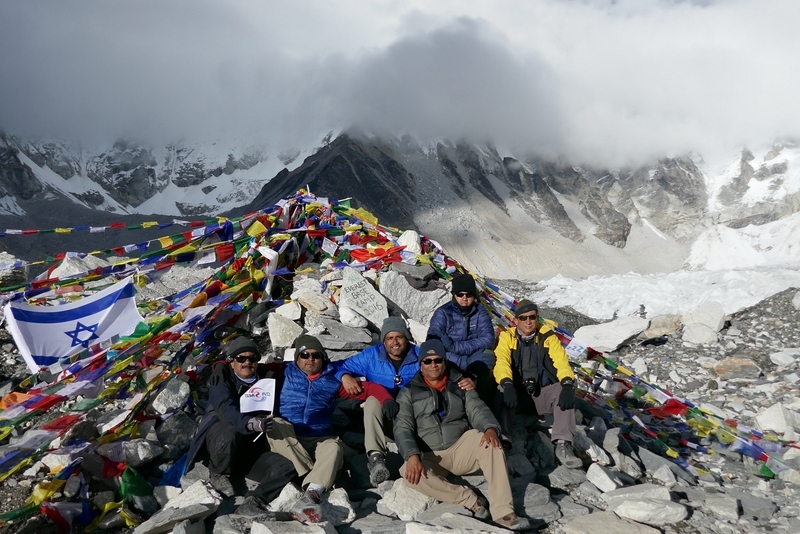 By the time we reached there, it was closer to the sunset time and the base camp was lit with a beautiful golden light coming from behind us. The sky was covered with clouds rolling northward and the mountains were playing hide and seek with us. 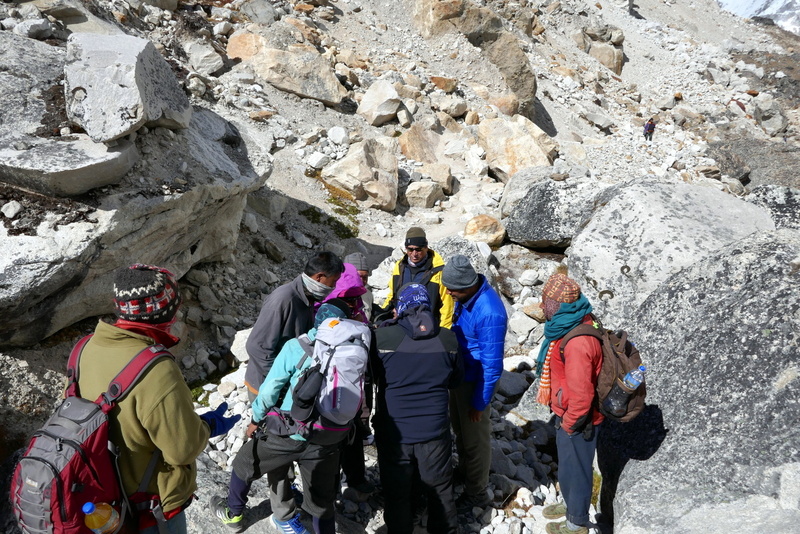 For some reasons, throughout our stay at the base camp (about 30 minutes) there were no other hikers there. It was all us and the support staff. During this time of the year, the main climbing season for the summit is over so the base camp was all empty. My guide tells me that if you come here during the main climbing season (May) this entire area turns into a small tent city. Finally, we are at the Mt. 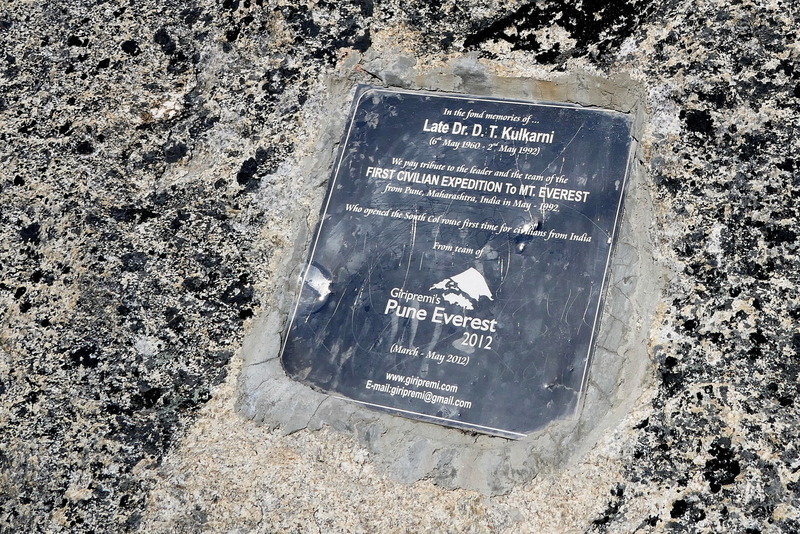 Everest Base Camp! Yahoo! Panoramic view from the base camp. Here is a beautiful video clip of the base camp from Varun’s Samsung Note 7. Despite being just a pile of rocks, I found the base cap stunningly beautiful. 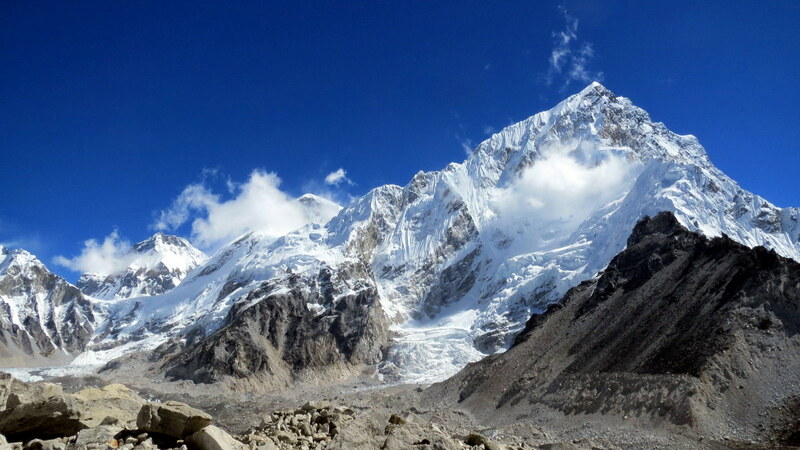 It is very large area surrounded by tall mountains and Khumbu glacier. The vastness of this area cannot be captured in two-dimensional photos or videos. 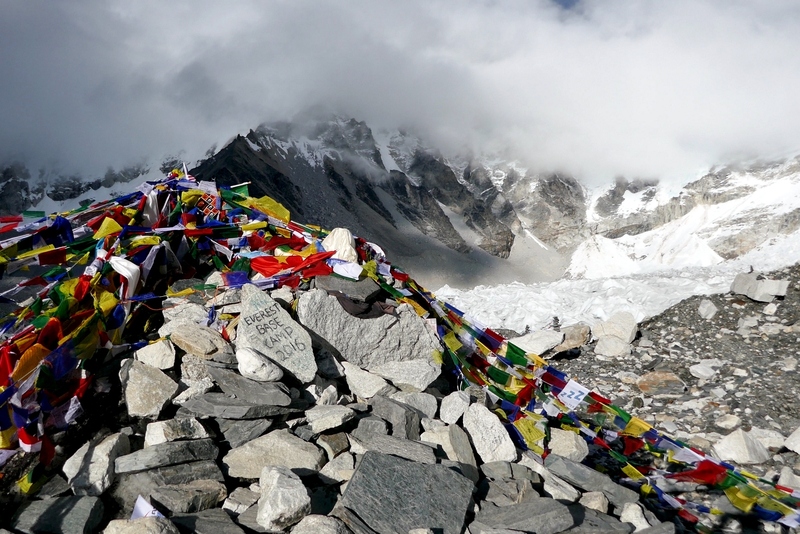 The colorful prayer flags and other offerings accent monochromatic landscape. The avalanches occasionally break the pin drop silence or falling rocks. The rolling clouds at sunset kept changing the scenery. 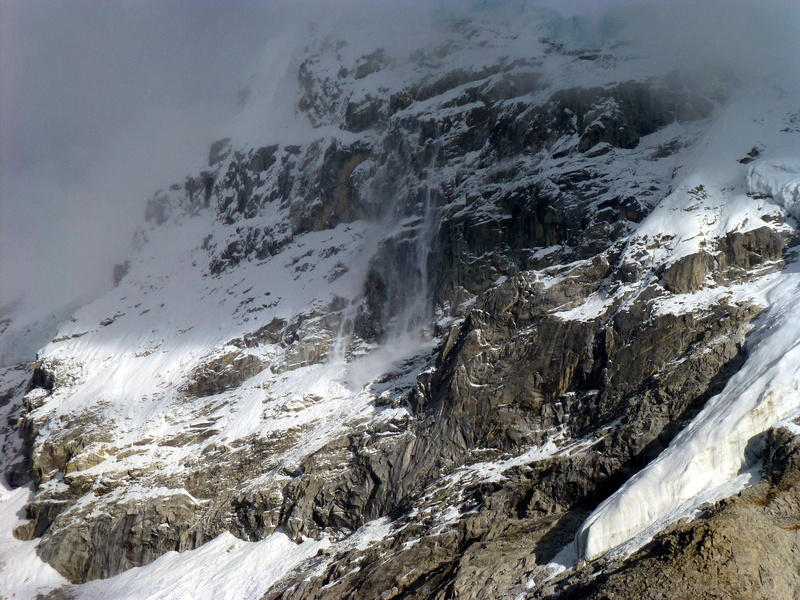 Avalanche – while we were on the trail, we witnessed at least two avalanche with large sound and ice fall for several minutes. 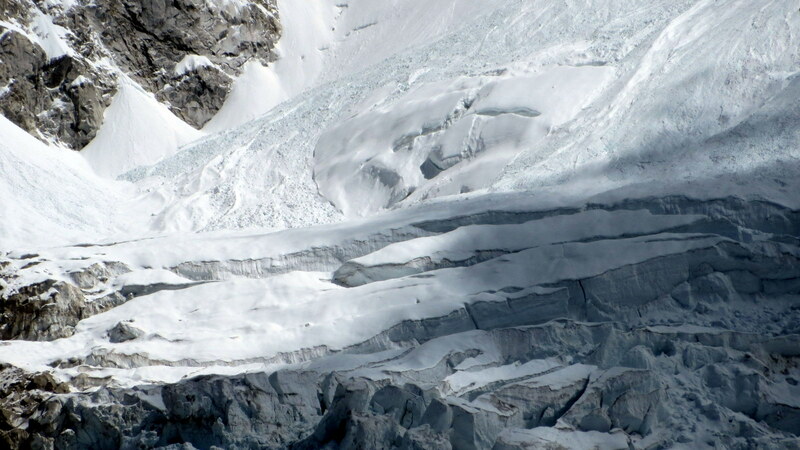 Here is a small video clip capturing one of the avalanche we witnessed during our trek. 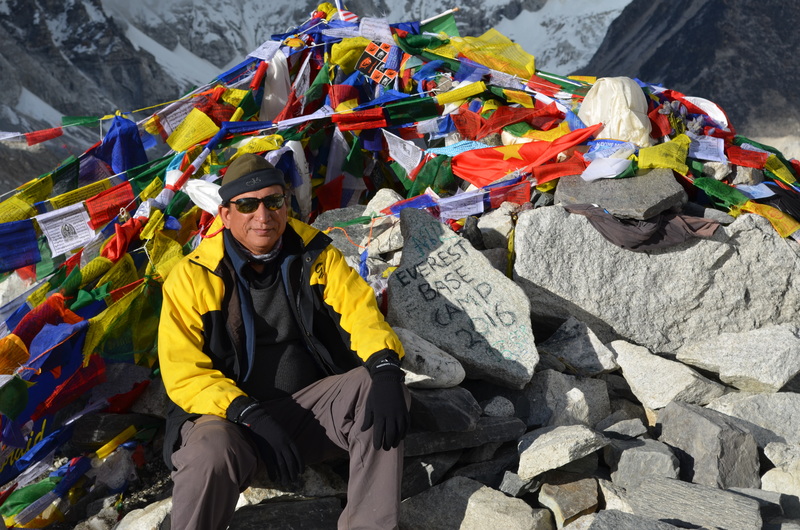 It took me about 3 hours to reach the base camp with several breaks for photography and rest. 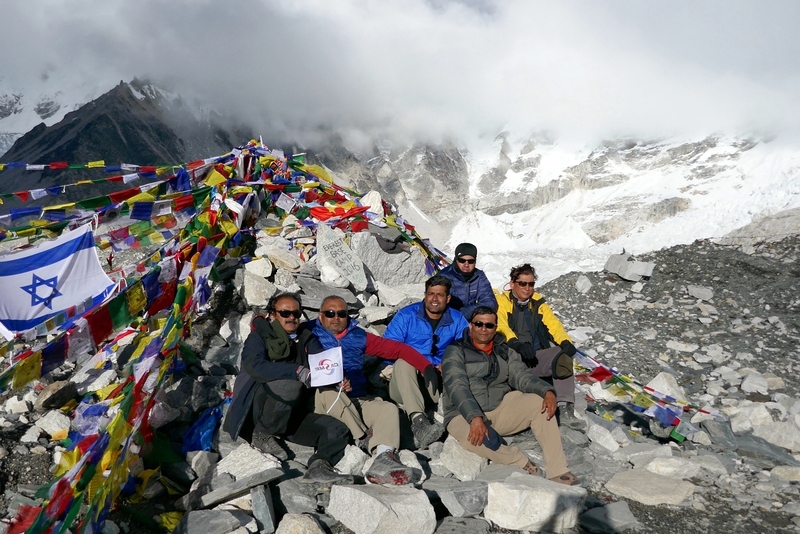 Our group at the base camp. 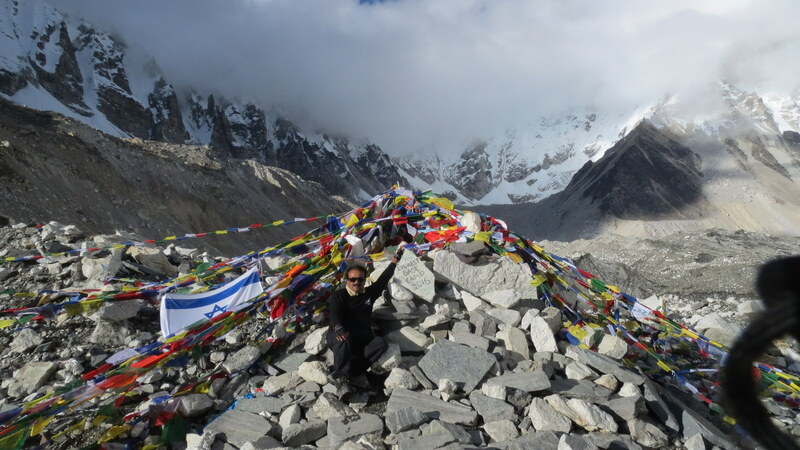 Fortunately, the clouds blocking the sun disappeared when we reached the base camp and throughout our stay we had a nice warm sunlight so we took many photos. Group picture from another angle. (and without our head gears!). After spending about 30 minutes at the base camp all by ourselves, we start our trek back to Gorakshep. On our return journey, Manubhai and I were trailing others and within minutes it got dark as we spent sunset hour at the base camp. We had to put on our headlamps to find our way back through the difficult terrain. The clouds were at the ground level so our visibility was very limited. It was scary and serene at the same time. 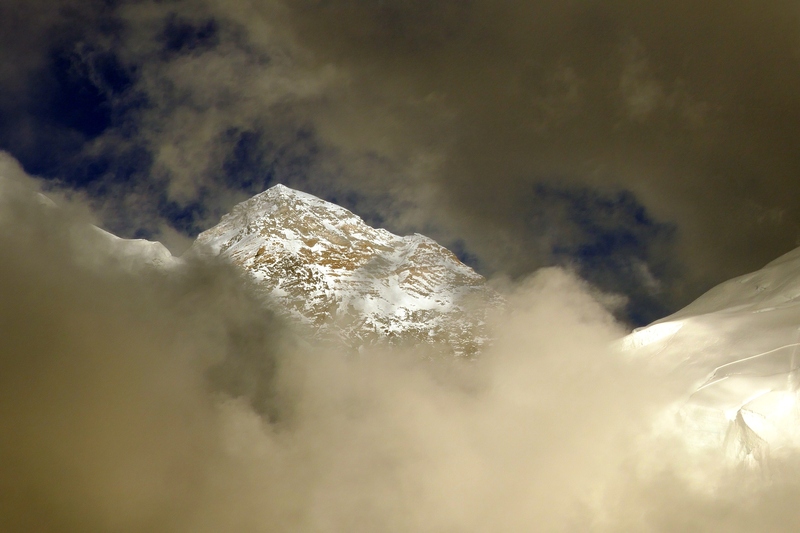 We stopped to take photos of the moon rising between the Everest and Nuptse – through a very quick and narrow opening in the clouds. Finally, we arrived at the Yeti “Resort” about 45 minutes later than our group. By then, the dinning room was buzzing with hikers sharing their stories. We had a table reserved by the guides so soon we were at the dinner table with our team. 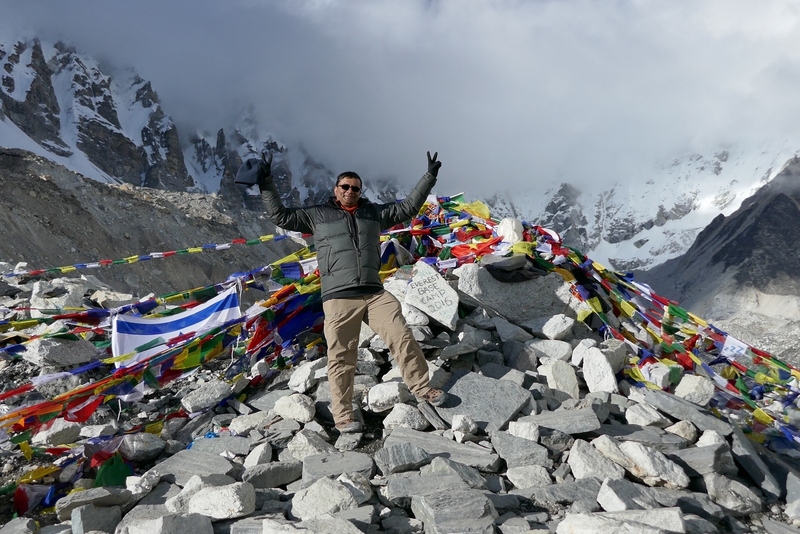 By the time the dinner was served, we had spent over 8 hours trekking from Lobuche and the base camp and were tired. I have not had any substantial meal since Dabeli lunch at Thukla and certainly feel the effects of empty stomach. Ground level clouds with tip of Mt. 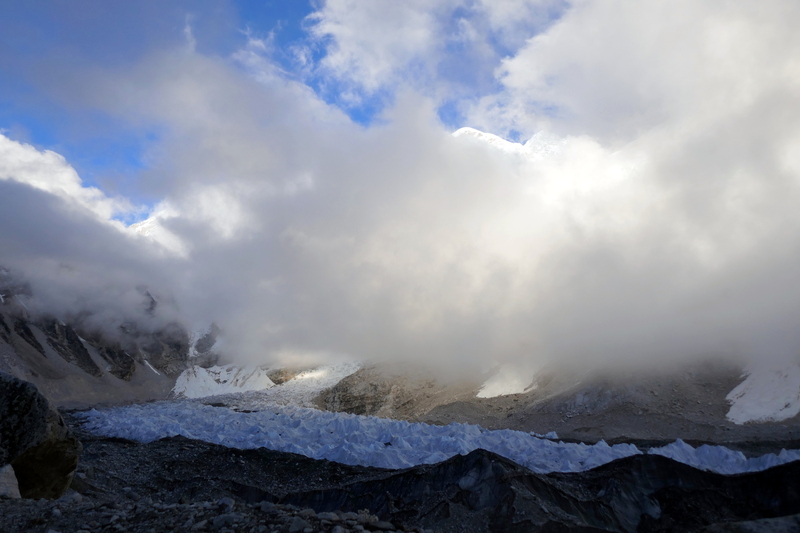 Everest above the clouds and Khumbu glacier below. After dinner, Doctor Dipak surprised me with a birthday cake and a candle – very cute. Our group (and some other hikers) sang happy birthday to me and after a brief celebration of my 50th birthday we were all back to our room for one last night on the trail. Today was the only day throughout the EBC trek for me to go without a shower. I don’t think the lodge had a provision for a hot water shower and even if they did, I didn’t feel like having one.